I met Basil AL Hadi last year at the Peace One Day event that was held at the CAP Warehouse and he’s one of the coolest artist I had the privilege of working with. He has a really down to earth vibe that is rare to see in music but not rare from the genre he is in. 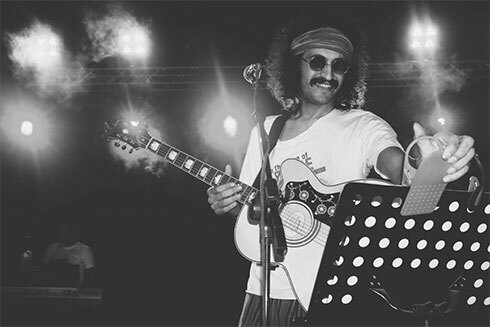 I personally classify his music as Arab/Reggae from the 70’s but he does Pink Floyd covers as well and wouldn’t feel out of place at a super summer beach party. I sat down with him to ask him some awkward yet musical questions which you can check out below. What are your favorite 5 albums? Who are your music heroes? When you think of Kuwait as a musical landscape what album or artists do you hear? How do you get inspired for your music? Mostly street interactions and daily society exchanges. Whats your favorite food and the music to listen too? A double cheese burger and no music while I listen. Absolute silence please. What do you like about your profession? Feeling the appreciation and good vibes of fans. Attracting people to enjoy live music. What do you least like about the music industry? The negotiation of the my art bothers me. How people value my projects. How long have you been doing music? If you could go back in time, what would you have done differently? I would have worked on my technique more. I would have approached it more professionally. What do you dislike in the music industry? What is the side of the you that the public never sees? What is the most unbelievable rumor made about you? That someone said I was being funded by a political group or that I support political things. The truth is I don’t, I like social interactions and daily street stories for my music. What is the magic formula? Be yourself 1st 2nd and 3rd… Speak and sing about the things that truly matter to you . What advice would you give to other musicians or artists? To work a lot it will find your sound. Then also understand your position in the music world. Understand what you stand and what is your vibe. Where can I find your work? Basil Al Hadi is currently working on his new album between Turkey and Kuwait. Are we on the verge of hosting the World Cup?